The greenhouse effect is the process by which the earth atmosphere is heated by the absorption of thermal radiations by different greenhouse gases & they do not reflect it back into space but reradiate it in the different directions in the atmosphere. Simply it means the absorption of thermal energy coming from sun into earth’s atmosphere by the greenhouse gases like carbon dioxide , methane , nitrous oxide , sulphur oxide , sulphur dioxide , chlorofluorocarbons , carbon monoxide , nitrous oxide ,water vapour etc. which then reflect this sunlight into the atmosphere later as they do not allow this energy or light to be reflected back in space .Greenhouse effect results in global warming as it increases the global temperature of earth due to absorption of sunlight & by holding it in earth atmosphere. In short greenhouse gases keeps the earth temperature warmer through a process known as greenhouse effect by trapping of sunlight or higher wavelength infrared radiations. It is a natural process of keeping the earth temperature normal otherwise, our planet earth would be a cold planet & it is very difficult for life to survive on earth . Inthis sense it sounds beneficial for our planet but now a days it is creating problem for different ecosystems & human life on earth as the emission of several greenhouse gases like carbon dioxide , methane , ozone ,chloroflourocarbons etc. is at a very fast hazardous rate in our atmosphere in todays lifestyle which are leading towards the increase in temperature every year now & resulting in global warming . There is increased concentration of these greenhouse gases due to humans industrial as well as social development structures of common life , which are having very adverse effects on our atmosphere . 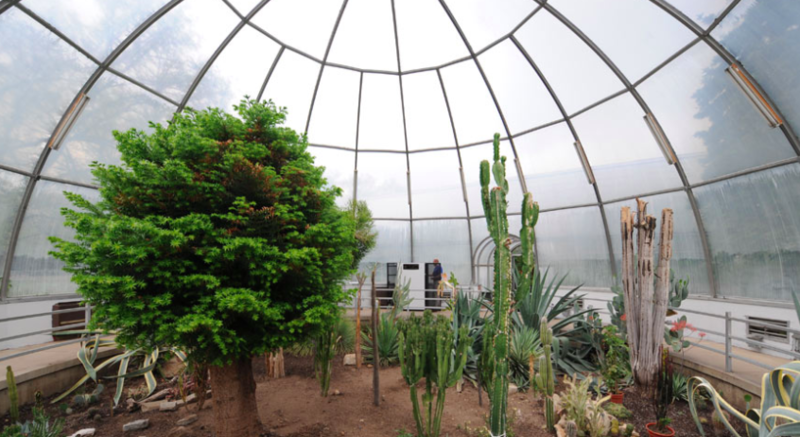 It can also be understand as the earth behaving like a green house of glass which absorbs the solar radiation from sun but do not let it go or reflect back into space by trapping it inside for use of plants , soil , etc. & remaining rest of energy i.e. sunlight for warming the atmosphere of earth . 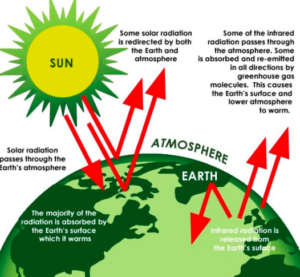 As it is very well clear from the greenhouse effect diagram that the amount of sunlight radiation reaching the earths surface is absorbed by atmosphere & some amount is reflected back into space .Then this energy is re-radiated back to earths surface by greenhouse gases present on surface in earths atmosphere . Then the heat energy is radiated from the earths surface into the atmosphere which causes warming of atmosphere & global warming of earth . The energy budget of green house gases is shown in the picture below . As the 23% of solar energy is absorbed into the atmosphere coming from sun into earth & 5% is going back into the atmosphere due to convection process from earths surface . Remaining 17 % energy reradiates into earths surface & then 12% will go back into space . Total in all 59 % of energy goes out from atmosphere & 30 % is lost to space in beginning while coming to earth & 12% long wave going into space so total of 100 % is going into atmosphere if 100 % is coming to earth & it results in warming of earths temperature due to absorption by greenhouse gases . Burning of fossil fuels : As we all know that the burning of fossil fuels like petrol , diesel , kerosene , coal etc . which are products form of carbon dioxide or on burning their carbon dioxide is released into atmosphere which is a green house gas & get mixed into it & plays its part into the green house effect by trapping sunlight . Today most of the developed countries are the leading carbon dioxide emitters in the whole world as they contain much more private vehicles & CFCs releasing lifestyle equipments which are not affordable in developing countries . Only USA single handedly produces the 22 % of whole world carbon dioxide emission in atmosphere which is very high & dangerous than countries like India which only emits 2.5 % carbon dioxide of whole world . Deforestation : Deforestation can be defined as the cutting or removing of trees for fulfilling the human needs of land for cropping & housing . Deforestation is also a very much responsible cause for greenhouse effect as by cutting large forest masses on earth their function of purifying the air by absorbing carbon dioxide & evolving oxygen so that carbon dioxide ratio in atmosphere should remain balanced . But by cutting forests this ratio of carbon dioxide emission exceeds over oxygen & as a result the greenhouse gas carbon dioxide creates greenhouse effect by trapping the solar radiation & helps in increasing the earth temperature . Also , a large number of harmful gases are emitted into atmosphere by burning of forests which are also responsible for greenhouse effect . Deforestation is alone a third most important factor in causing greenhouse effect after CFCs & burning of fossil fuels. Emission of radioactive rays & wastes from nuclear power reactors : As the nuclear power reactors emits the high wavelength radioactive rays of infer-red region which also pose a danger of absorbing sunlight on earth & not let it go reflected back into space & in this way a cause of greenhouse effect . Forest fires & burning of natural vegetation & crop residues : When the forests catch fires due to their dry nature then there are a lot of greenhouse gaseous emissions from that fire into atmosphere which can also be a powerful cause of greenhouse effect & due to this tree cover of earth is also reduced which cause carbon dioxide to increase its concentration from the present level to too many folds which is dangerous for our atmospheric layer & also cause increase in global earth temperature by greenhouse effect . Burning of natural vegetation & crop residues also creates the same pollution problem as well as temperature problem for our planet due to greenhouse effect . Chloroflourocarbon emission from the equipments like air conditioners , microwaves , vehicles etc. : As this emission will create a harm to our ozone layer which protects us from harmful UV radiations which otherwise can pose a threat to our skin by causing skin cancer like problems . CFCs also increase the temperature of earth due to greenhouse effect leading towards global warming . Vehicle & industrial pollution : Several greenhouse gases like nitrous oxide ,sulphur dioxide , methane etc. are emitted from vehicles & industries like paper pulp industry , tanning of leather industry , cloth industry , steel power industry etc. as products & then they get mixed into our atmosphere which leads towards the greenhouse effect . Melting of ice caps which is creating the problem by releasing of methane into the atmosphere which is a greenhouse gas & causes the greenhouse effect . Acid rain : Acid rain is also a helping cause of greenhouse effect as constituents of it are greenhouse gases like carbon monoxide , sulphur dioxide , nitrous oxide which are very dangerous for our atmosphere as we know about them , so they cause greenhouse effect . WHAT ARE THE GREENHOUSE GASES & THEIR EMISSIONS & THEIR RATIO IN ATMOSPHERE? Contribution of different gases into greenhouse effect is also shown below . It can also be realised from here very well that most contribution is from water vapour & carbon dioxide & somewhat from methane. WHAT ARE THE WAYS OF REDUCING THE GREENHOUSE EFFECT? Use of public transport for travelling instead of using personal vehicles like cars, bikes etc. Use of CNG operated transporters instead of petrol or diesel operated vehicle. Making the use of renewable resources of energy more popular so that the conventional resources should be less frequent in use & less emission of greenhouse gases in the atmosphere . Less use of air conditioners & microwaves which emit CFCs in environment & making use of natural modes or fans as substitutes of these. Treatment of industrial wastes so that they do not emits harmful greenhouse gases in the atmosphere causing greenhouse effect. Reduce the use of electricity by turning the power operated appliances off when not in use. Use of natural means of power generation instead of nuclear means of power production. Organising the Earth Hour like functions more frequently & more likely in all over the world to save earth from green house effect. By using the proper & full use of refrigerators & microwaves in storing & cooking food. Use energy efficient appliances & rated instruments for commercial use. Planting of more & more trees to save earth from increasing carbon dioxide concentration in the atmosphere. By making strict rules regarding the use of energy appliances releasing greenhouse gases by the government. You’ve got high quality content. I am studying your article greenhouse effect that’s the very good article. Share everything with your article.